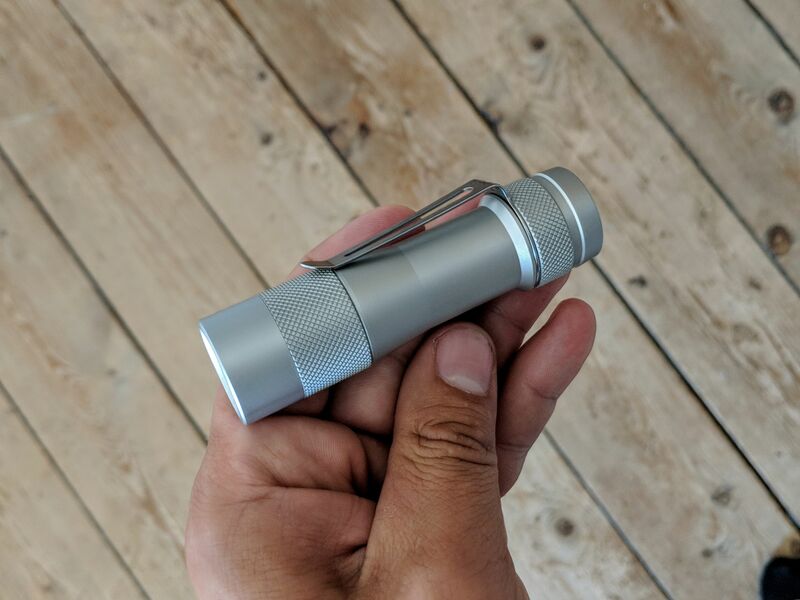 A compact, ergonomic, feature-packed EDC-style light. Estimated price is $36 for XP-L HI, or $30 for other emitters. 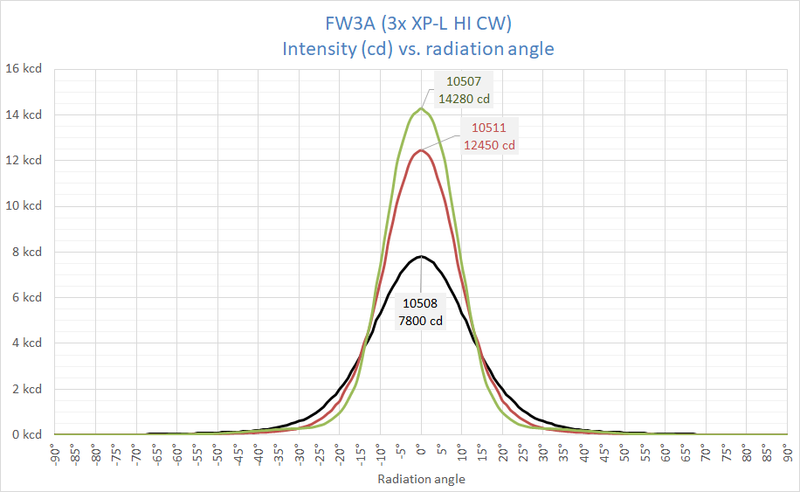 Emitters are XP-L HI 3D (~4875K) for now, and then probably SST-20 4000K 95CRI soon, and with any luck, also LH351D later. Group buy lights should be entirely free of markings and logos. After the group buy, Lumintop will probably sell a branded version with their bunny logo on the tail. Unanodized bare aluminum might happen later, but this isn’t determined yet. To sign up: Post in this thread. When it’s available to buy, you’ll get a private message on BLF. - Waiting for news and updates. - Waiting for the project to come to fruition. - Waiting till the result can finally be ordered. 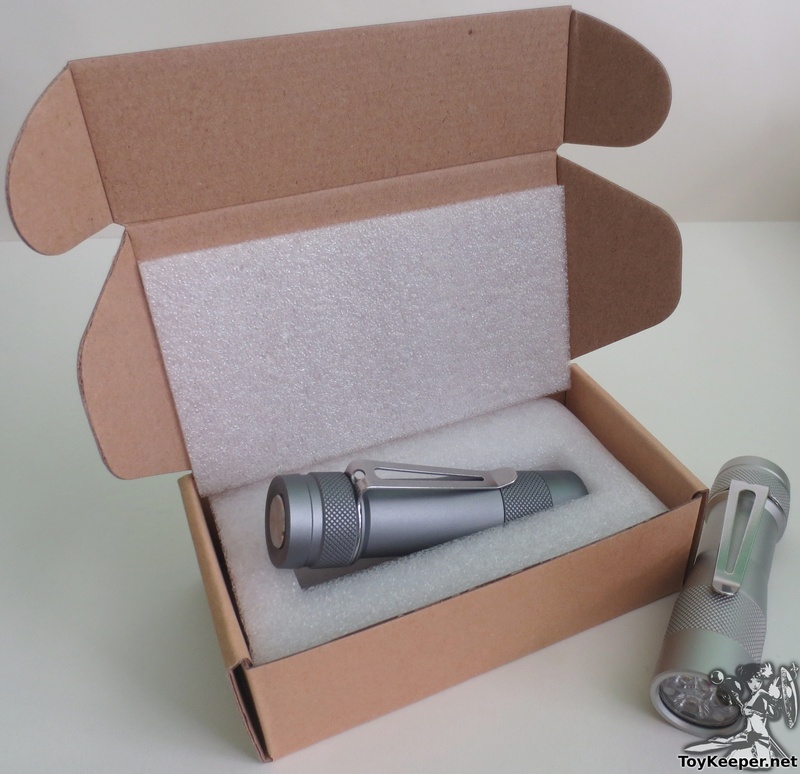 - And then waiting for arrival at your home, shipping from China can take a long time. The production model is expected to be like this second picture, only in dark grey. 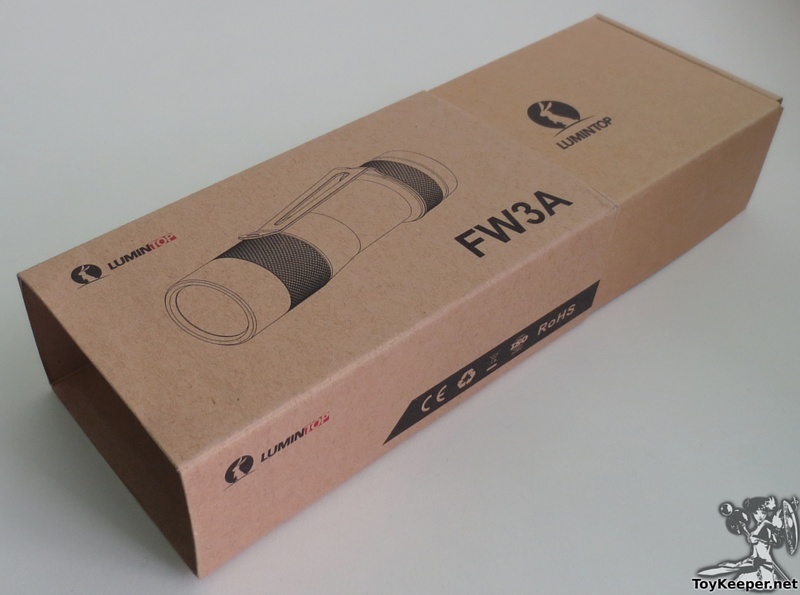 The FW3A is a collaboration between TLF (Germany) and BLF (global). 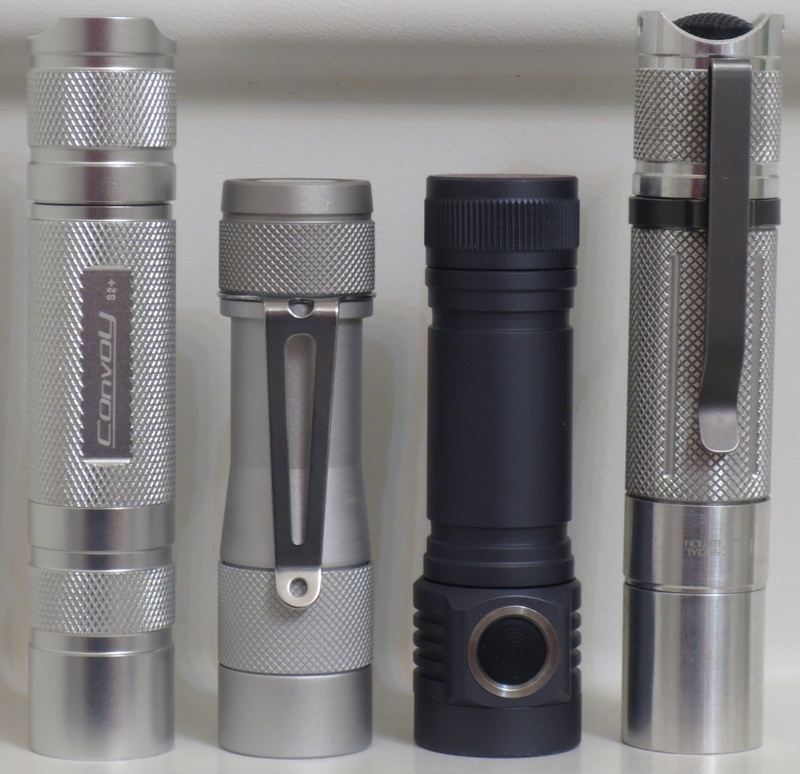 Fritz15 made a small triple flashlight on his lathe. TLF reacted very positively and at first a small hand made batch would be pursued. But this elegant design screams for a wider audience, so it became something bigger. An unusual feature is the electronic tail switch. This allows the light to do much fancier things than a clicky switch, yet retains the ergonomic benefits of a clicky tail switch. Wide range from ~0.3 lm to ~2800 lm. Regulated output up to ~900 lm. The original plan was clear anodized aluminum complete with the original machining marks, but after three rounds of prototypes this did not happen. The attempts did not turn out as desired. So, based on forum feedback, the plan is to do dark grey anodizing instead. It is also possible that a bare unanodized version could be made later, but this remains to be determined. Target $30 including shipping, manufacturer can decide own pricing afterwards. Maybe $36 if XP-L HI emitters are used. For price and heat, lower values are better. Throwiness depends on personal needs and taste. For everything else, higher values are better. Throwiness is a rough measure of candelas per lumen. It’s the overall beam shape. Even the throwiest option is not a thrower, because compact triples are floody by nature. 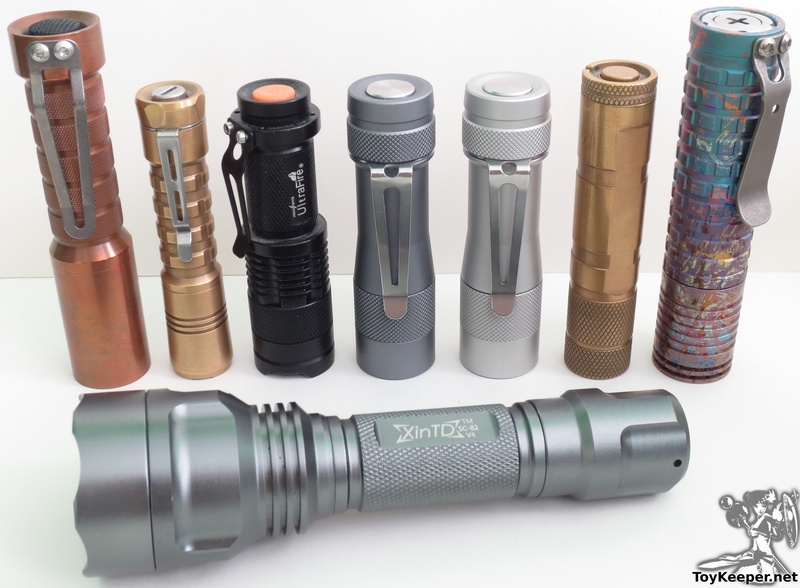 At a guess, the range here is about 2 to 4 cd/lm, and common reflector-based EDC-style lights are usually about 5 to 10. Beam is the overall beam quality, like smoothness and color consistency. 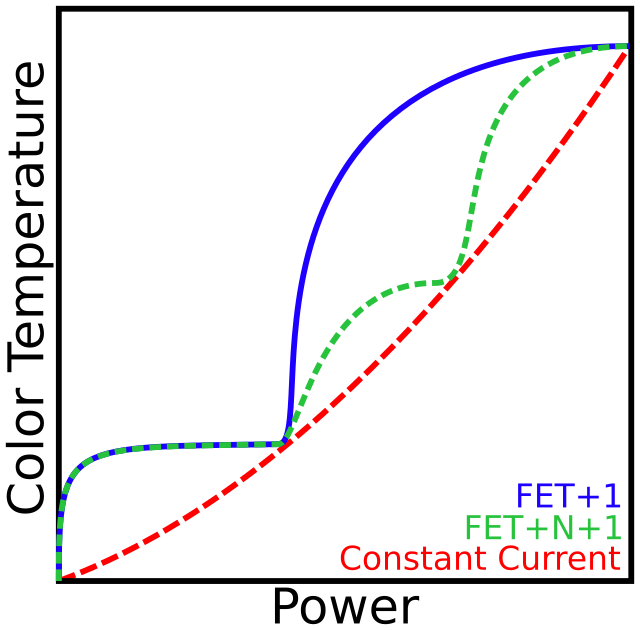 More peppers makes thermal management harder, reduces the sustainable brightness after step-down, and increases risk of damaging the emitters on turbo. 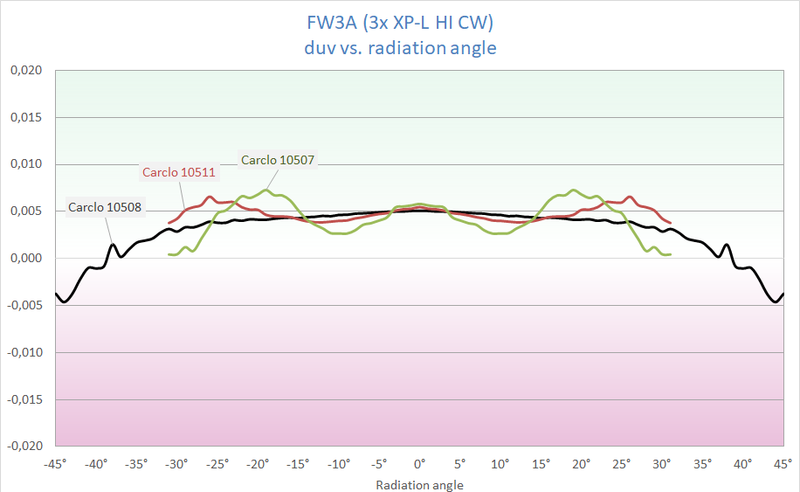 Values indicate approximate performance in a Carclo 10511 optic using a FET for direct drive on 1×18650. These have not been directly tested in the FW3A host, so this data is more of an educated guess than a measurement. XP-L HI: Costs more. Medium CRI. SST-20: Green at low levels. LH351D: Super floody. Green at low levels. May be unobtainable. Integrated LED shelf for good thermal dissipation. 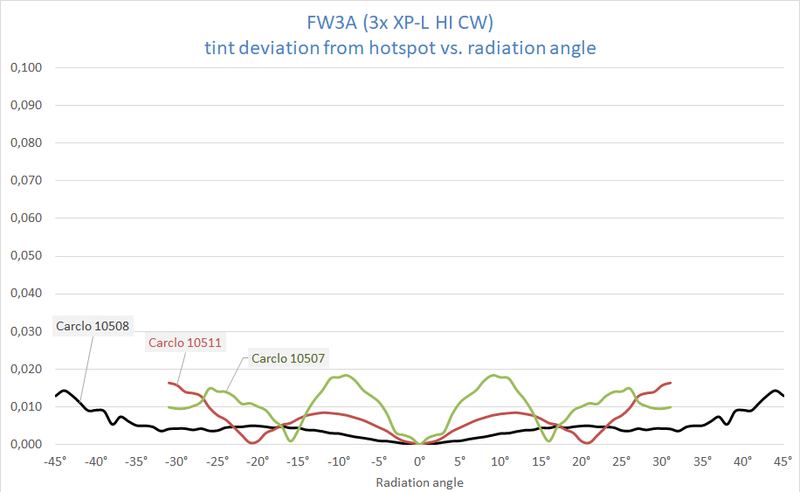 Triple TIR optics http://www.carclo-optics.com/optic-10511 , easily replaced with other common models if desired. More info in post #3 below. O-rings at lens, bezel, both ends of body tube, clip (to keep it from spinning), and inner tube (to isolate it from the outer tube). Button uses rubber boot internally to block water ingress, with metal cap on the outside. Set of spare O-rings in box. Smooth thermal regulation to avoid overheating. However, turbo is a burst mode only, and the user should use it only for short periods instead of relying on thermal regulation to prevent heat damage. Full turbo is powerful enough to start fires in just a few seconds, especially when aimed at dark-colored materials. Lights made as specified and agreed upon. Samples as specified and agreed upon for the team before the go is given for actual production. This light is a joint project between TLF and BLF. For English speakers, use this thread, right here on BLF. Probably April or May of 2019? Things have been delayed several times. Ordering and payment: Not yet determined. Ordering and support will probably go through Neal’s shop, and payment is probably Paypal. Will there be a 18350 version / 18350 tube? No. The entire back half of the light would need to be redesigned/replaced. Will there be an empty host version? Probably not. The only components which aren’t custom are the LEDs and optic. Can I buy spare parts, like an extra driver or clip? Not yet determined. This hasn’t really been discussed. 2019-01-31: Proto4 had an issue with the driver cavity being too small. Needs to be fixed before production. 2019-01-29: Proto4 samples have started to arrive. 2019-01-28: Production samples begin to arrive tomorrow for testing/review. Production should start within days, if things go well. 2018-11-28: Trying to get production started. 2018-09-17: Third (final?) 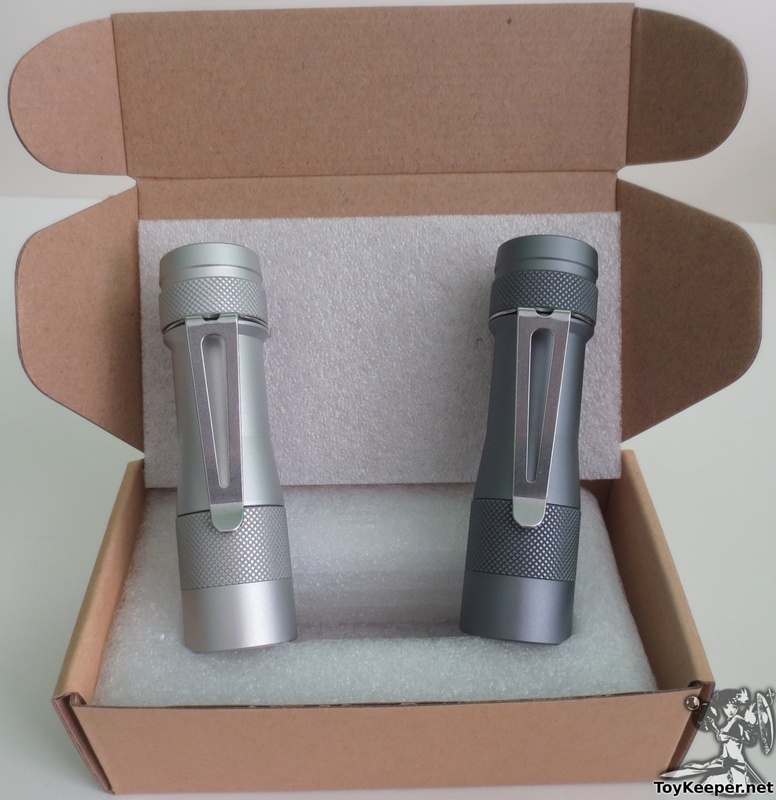 prototypes arrived, waiting for test results from Fritz and Cawi. 2018-06-22: Second prototypes tested, emitter poll results collected, sending in feedback for host changes and emitter type(s). Only a few product details left to finish before production. 2018-06-08: Second prototypes arrived, many things are fixed, only a few things left to finish. 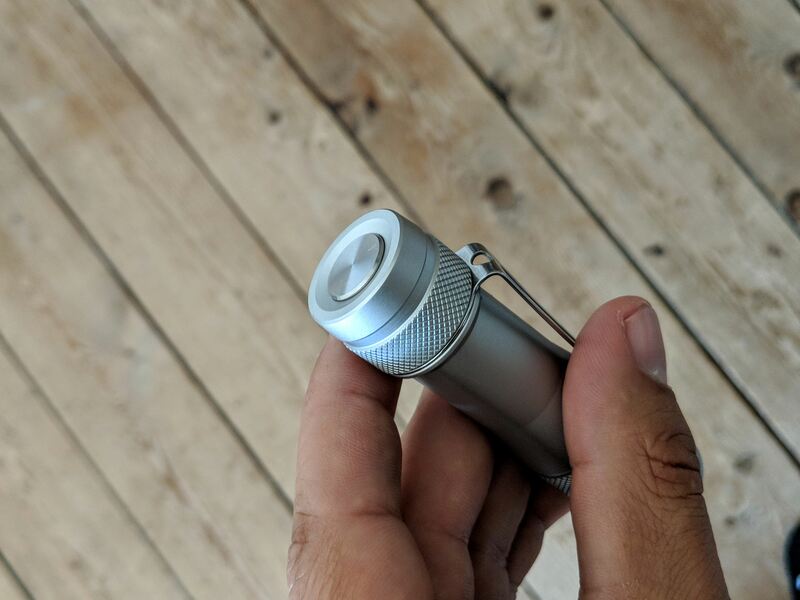 2018-06-03: Lumintop made a second prototype, hoping it’ll arrive soon for testing. 2019-04-11: Updates in post #1 and #3. 2019-03-31: Added emitter comparison table. 2018-11-28: First post updated to reflect recent news. 2018-10-05: Current status updated. Not sure what the status is for the latest prototypes. 2018-06-22: Updated spec for optics and O-rings, added note about thermal regulation. Moved emitter type polls down to old news. 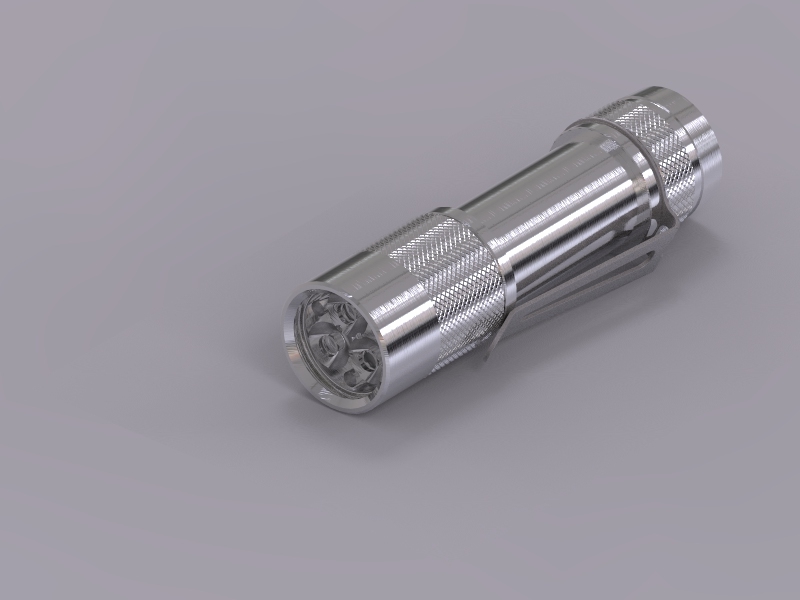 2018-04-24: Added newer model render with tapered tube. 2018-04-19: Muggle mode poll created. 2018-04-17: First post updated, small FAQ added. 2018-04-05: Moved interest list to its own first-page post. 2018-04-03: Added firmware/UI info to its own first-page post. Thanks Wrathbringer27 for the translation! 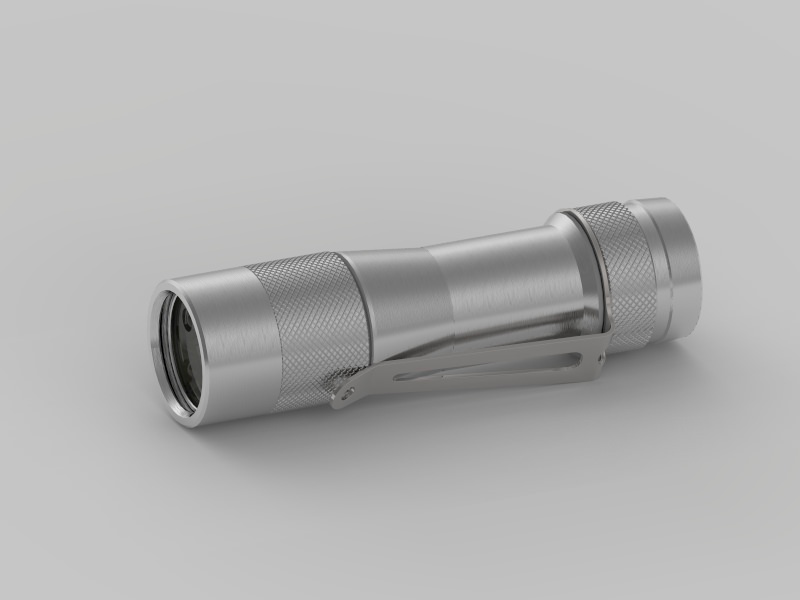 Small elegant EDC triple flashlight designed by Fritz. Clear anodisation (no pigments) and NO sanding or sandblasting of the parts after machining. This makes the FW3A look like it came of a lathe of a skilled machinist with the added protection anodisation offers to keep it beautiful for a long time. The FW3A uses the Andúril‎ firmware by ToyKeeper. It is similar to Tom E’s fantastic NarsilM, but with some extras. Basic usage is very simple: Click for on/off, hold to change brightness. But there’s much more available for those who want it. The interface uses mostly the same ramping as Narsil, and basic usage is identical. Click to turn the light on or off, hold the button to change brightness. 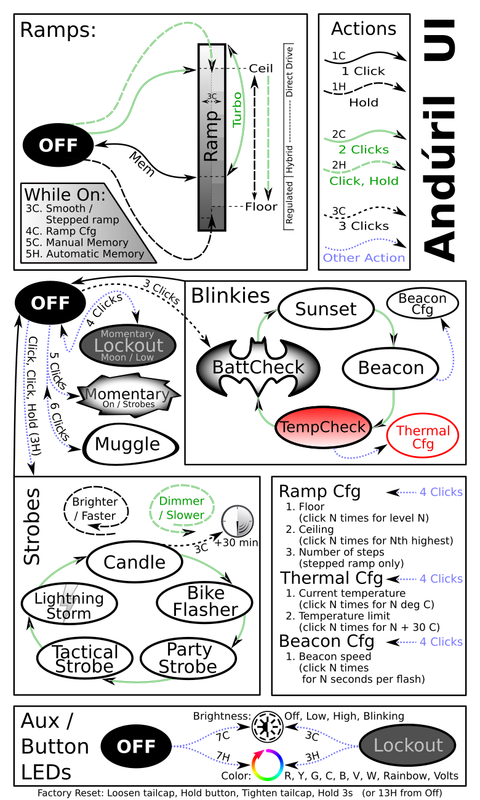 However, this style applies to both the smooth ramp and the mode group, and the user can switch between them with three clicks while the light is on. No need to remember two interfaces or navigate a config mode. Ramping also has some additional usability tweaks. If the user holds the button, ramping will always go up unless the button was released less than a second ago or it’s already at the top. To ramp down without ramping up first, do a “click, release, hold”. This eliminates the need to remember which way it was ramping in the past. Both the smooth ramp and mode group are configurable. The user can set the lowest level, the highest level, and (mode group only) the number of steps. Full turbo is still available via double-click even if the ceiling is set somewhere more sensible. While on, a double click toggles between turbo and the memorized level. So, if you hear a noise and want full power for a moment, double click. When you’re done, double click again to return to the original brightness. BattCheck: Show remaining charge in volts and tenths. Sunset: Start at “low”, then slowly ramp down to moon for an hour, then turn off. Beacon: Blink once every N seconds at the last-ramped level. N is configurable. TempCheck: Show current temperature and optionally configure settings for thermal regulation. Bike flasher: Steady output with a “stutter” once per second. Adjustable brightness. Party strobe: Motion-freezing strobe. Adjustable speed. Tactical strobe: Bright, disorienting strobe. Adjustable speed. Lightning storm: Exactly what it says on the tin. No adjustments available. Candle: Simulates a flickering candle or fireplace. Adjustable brightness. Also works as a self-shutoff timer in 30-minute increments. 4 clicks: Soft lockout. Light won’t turn on until it’s unlocked. This mode doubles as a momentary moon mode, so when the button is held down it’ll light up at the current ramp floor. 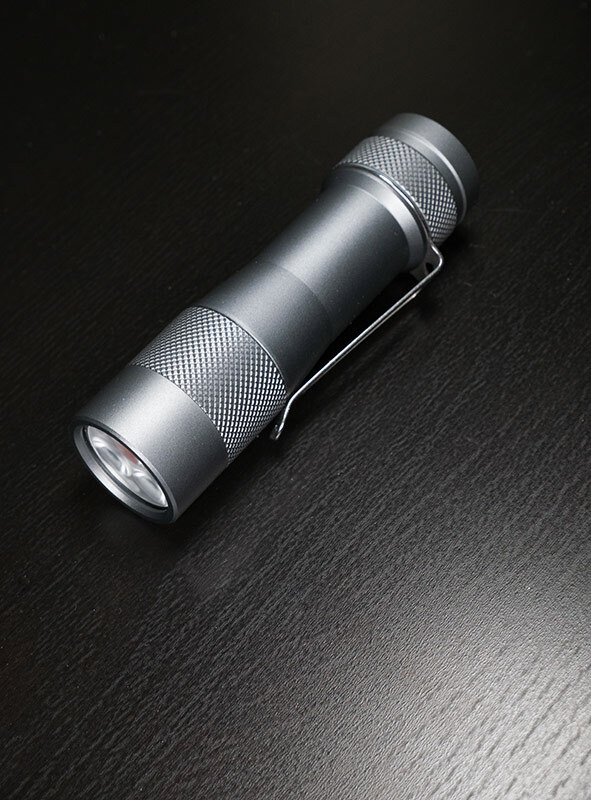 This is handy for checking something quickly without having to unlock the light. 5 clicks: Momentary / signalling mode. Using the last-ramped brightness, the light will be on when the button is held, or off otherwise. Good for Morse code and such. To exit this mode, physically disconnect power (unscrew the light). 6 clicks: Muggle mode. An extremely simple interface with a limited brightness range — ~10 lm to ~300 lm, with smooth ramping and no blinkies. Persists after a battery change. To exit this mode, quickly click exactly 6 times. Low voltage protection will reduce the brightness when the battery is low. If the brightness is already down all the way, it will shut the light off entirely. Thermal regulation keeps the light from overheating. It’s not normally visible by eye though; it ramps smoothly across 512 internal steps to adjust output while it searches for the highest level it can maintain without overheating. By default, the ceiling is set to the highest fully-regulated output level — 3 Amps. 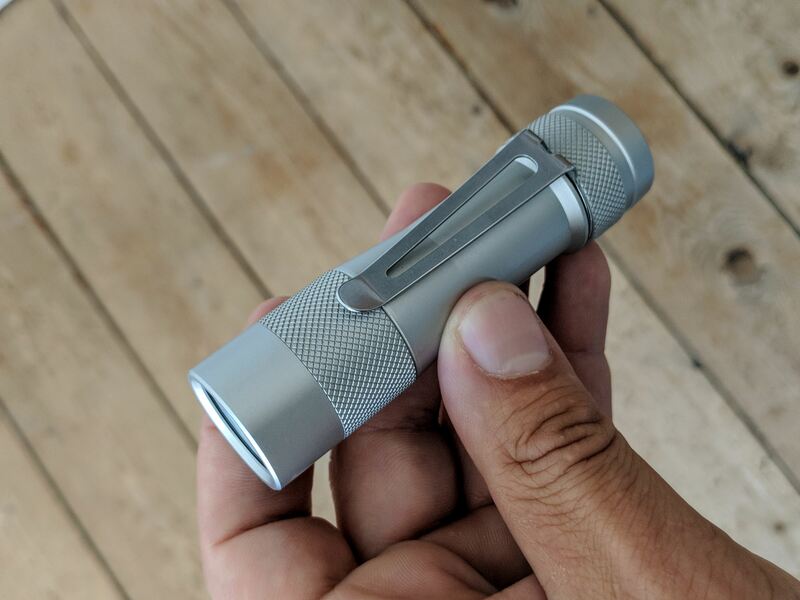 This is about 1000 lumens. Full turbo is about 3000 lumens, but cannot be sustained for long due to the heat it creates. There are also some other interfaces available for this hardware, but it requires the user to flash different firmware. 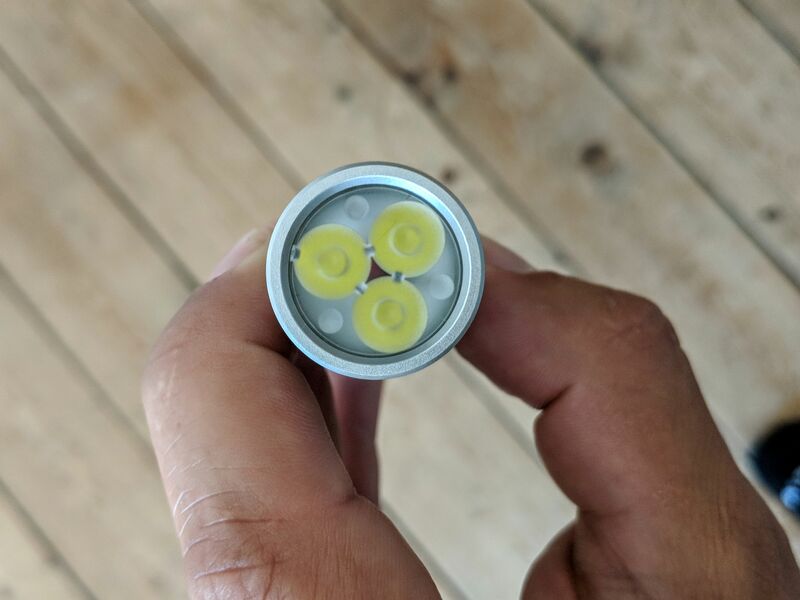 You can make it work like a BLF Q8, or like an Olight, or like a Zebralight, for example. However, these are not tested and not officially supported. 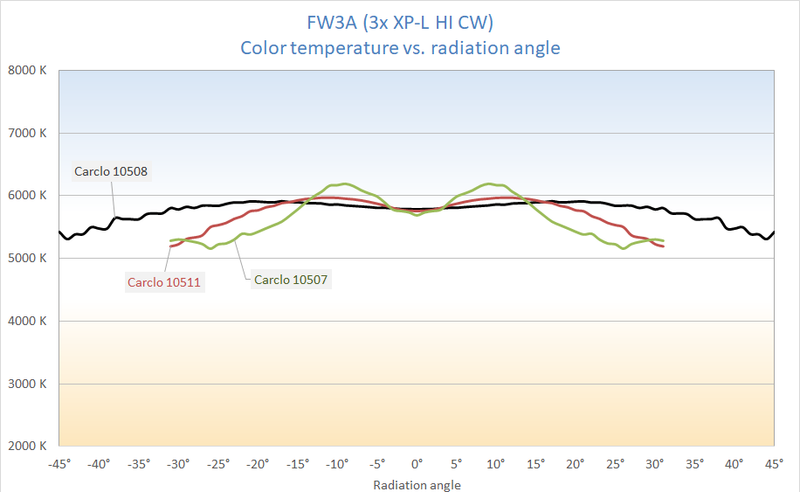 The FW3A uses a FET+7+1 driver. This keeps most of the levels pretty stable and reasonably efficient, as far as linear drivers go. But it still has a direct drive circuit for turbo. The optic is a Carclo 10511, which is a lightly frosted optic with a relatively narrow spot. It gets almost as much throw as the 10507 optic, but with greatly reduced tint shift and artifacts. Tint deviation (deltaxy). How much does the tint change within the beam. This illustrates the 10507 color artifacts the best as it has a big shift right in the bright part of the beam. The further from the hotspot the shift is, the less noticeable it is. This list is manually updated but generated by a script, so the request numbers may change when data is updated. Last I checked, TLF adds about 400 lights to the list below. Aha, so this is what you were talking about. …uhm.. no DD driver i hope? Hopefully it will be a CC driver, but with enough (6 to 12) Amperes, like the LD2 (or LD3?) without PWM. 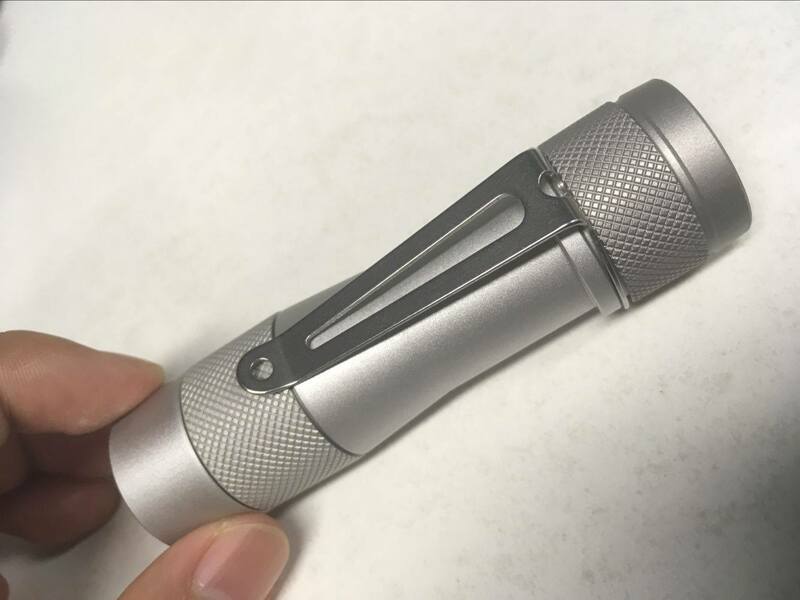 Another thing, about the anodizing, clear anodizing can make it look very cheap, maybe better to have no anodizing OR sandblasted finish. But i love the design concept. Will possibly be as tiny as the DQG ? 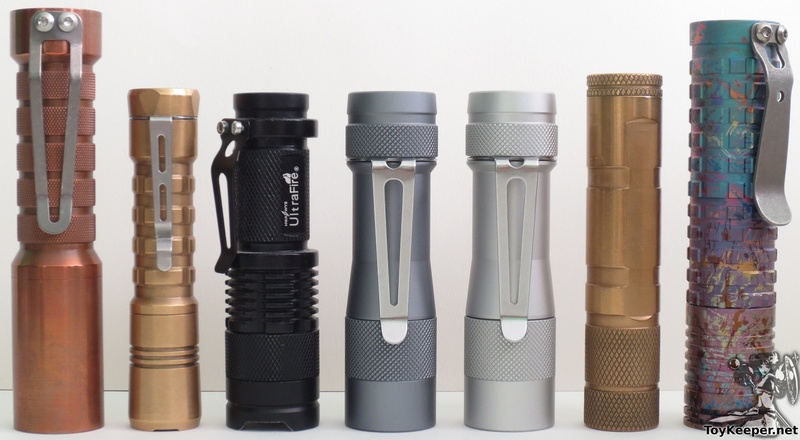 This would be my first multi-emitter flashlight since the old days of blue and purple leds. Put me down for 2 also, sharp looking flashlight! I’d be interested in 1 please. One for now with the option to increase order at a later date. Looks like another great light with a Coooooooool looking factor. I would be down for 2 also! Count me in for one, this sounds great! BTW , even should be 25$ possible . I’m assuming 18650, I didn’t see it specified. I’ll have to toss my hat in the ring on this one as well. In for one, really like the look of this! So, since the design is complete does this roll right into prototyping? I may be missing something, but why not just put the driver in the tail? Most of these FET and 7135 drivers work by applying PWM (and in the case of the 7135, variable resistance) between LED- and BAT-. The connection from BAT+ to LED+ is direct; it doesn’t even touch the driver board in the case of the new version 17DDm. Regardless, this looks awesome. Please put me on the interest list. In for one, whenever it’s ready. I never thought of that, it’s a good idea ! The driver will need a BAT+ too for it to work. But that inner tube can do that. but a thin strip of copper or even nickel plated iron would suffice. Me too, if that wasn’t already obvious.